Just in case you’ve been spending time on a deserted island, you might not know that the Web these days has been moving rapidly towards a profoundly more social and interconnected version of itself. It was just over a year ago now that social networking eclipsed e-mail as the primary form of communication in the online world. As of 2010, literally millions of Web sites and thousands of Web applications now have social networking weaved into them to make them easier and more productive to use. These features are now familiar to those that use the Web regularly. They’re as simple as a sharing button to drive information to the contacts in your favorite social network. Or it can be more sophisticated, such as signing-in to Web applications with your preferred social identity or using your contact list to enlist participation in something you’re doing online (see Facebook for Websites and OpenID). However it’s accomplished, the value of using your social persona and associated circle of contacts to improve our digital life is becoming clearer and clearer to the online population as a whole. As a result, our applications are getting more social by making it easier to either draw in your social connections to collaborate or send information to them, typically in the activity streams (news feeds) in their favorite social networking clients. We now see the same evolution occurring with enterprise software. The adoption of social features is now happening in roughly the inverse order of the age of the platform. SaaS first, then large big box native apps. For example, leading SaaS provider Salesforce added a social layer, known as Chatter, to its CRM platform late last year. Many traditional HRM and CRM platforms are also working on incorporating social but have not yet released them, though there are certainly notable exceptions such as Epicor’s recent announcement of its addition of social features to its ERP system. Even formerly-stodgy subjects such as supply chain management have started seeing the benefits of social computing. Consequently, even though this evolution is still in its early stages — and will often overlap with the more horizontal social computing efforts materializing in enterprises these days — the outlines of what are taking place are starting to become clear: We can expect to see social features in most types of COTS software in their new releases going forward as it becomes an expected capability in modern business software. That business applications are also becoming smaller, more Web-based, mobile, and self-service is also driving this trend forward as we’ll see. However it’s not just big box applications that are going social. 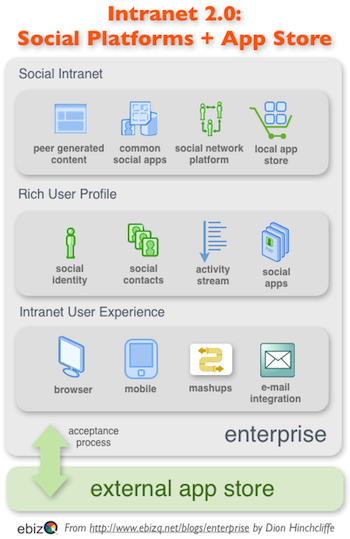 The enterprise intranet itself has become much more social for many firms recently. An organization’s intranet has always been a popular location for simple Web apps such as employee directories, meeting room scheduling, and so on, but has recently moved into more sophisticated types of productivity applications such as timekeeping, project planning, document/content management, and employee self-service. Now companies are adding social features to their intranet. Companies updating their intranets are now adding such features as rich user profiles, activity streams, discussion forums, wiki capabilities, and other social capabilities. This is not an occasional phenomenon, it was just this year that the high-water mark was hit: Two thirds of firms now have at least one social media capability on their intranet, as of this year. As companies begin upgrading their their local intranets to add the latest capabilities, along the way they are also adopting newer social computing platforms that also bring with them the concept of discrete social applications. These are applications, developed internally or by 3rd parties, that have a rich user profile that maintains knowledge of you and your connections with others in the organizations as well as centrally tracking your social business activities. The leading model at the moment for interoperable enterprise social applications is OpenSocial, an open standard originally sponsored by Google that is getting traction in the enterprise. For now, it is the only widely supported social application model for enterprise social software. Actively supported by the likes of Jive, Cisco, SocialText, Atlassian, IBM, SAP, and other top software vendors, OpenSocial defines a common social app model for Web-based portals that support the standard. It’s also worth noting that OpenSocial is a popular app model for top consumer social networks such as LinkedIn, MySpace, and Ning and has consequently been tested in scale and is relatively familiar to developers. I enjoyed reading your insight…social media software is vital in marketing today, we work at creating it every day.